Quick Noodles: Always A Good Option | Izzy have you eaten? Friends over to dinner tonight, Izzy. One guest didn’t eat meat or molluscs, so I made rice paper rolls with prawns to start. As you know, it IS rice paper roll season at the Brands! The rolls were also bursting with fresh mint and a mixture of crushed peanuts with oyster and sweet chilli sauce. Also lots of snow pea sprouts. 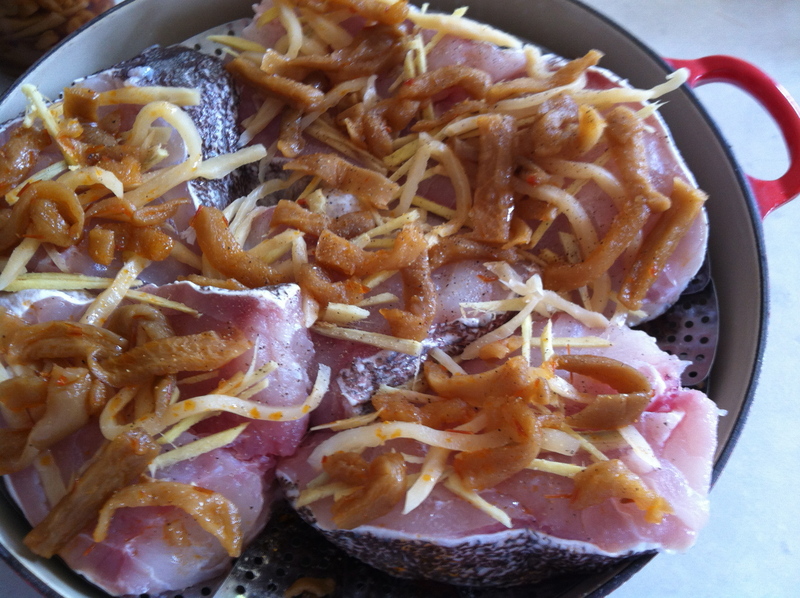 I bought beautiful grouper fish at the Asian market and decided the best way to cook it was Chinese style: so I arranged the fish steaks in a steamer, and dressed the pieces with tons of ginger slivers, chopped garlic, pickled turnip and white pepper. The pieces were laid on layers of dried shitake mushrooms which I had soaked in water before hand. Nice flavour! I steamed them on a low flame for about twenty minutes and served them with…. noodles! 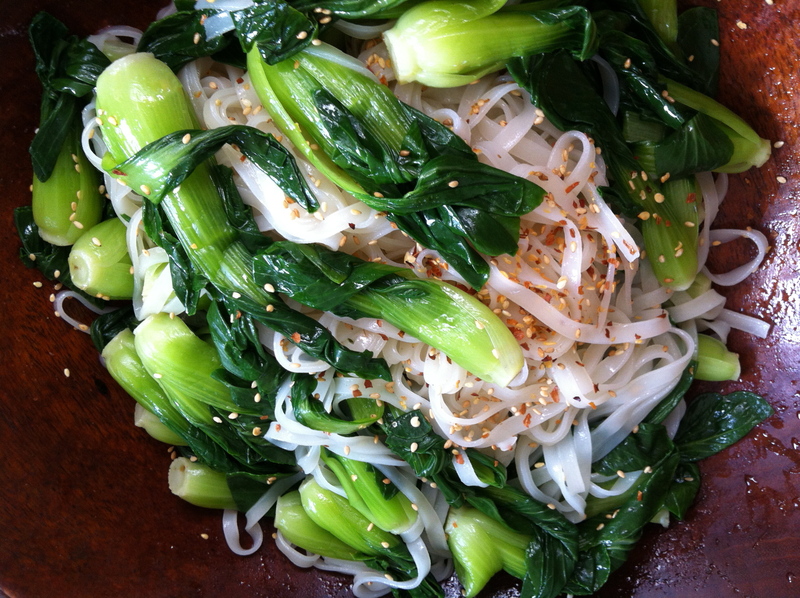 The noodles worked well: I had bought baby bok choy, so steamed them quickly in salted water. I put them aside and then boiled a small bundle of flat rice noodles. When they were soft, I drained them and tossed them with the bok choy, sesame oil, sesame seeds and chili flakes. Good, and very simple. I know you’d like it. The leftovers will make an ideal school lunch for your sister tomorrow. Don’t you make a similar version of this with soba noodles? Do you toss them in Mirin? Mmmm! This entry was posted in GROUP C, Uncategorized and tagged Bok Choy, Grouper, Mirin, Sesame by tgb9593. Bookmark the permalink.